How Are You Managing Biofilm? In our clinical practice as a Dental Hygienist staying current to the latest techniques for biofilm removal is important. Technology is transforming all areas of our life including the profession of dentistry. If you have concerns that you may not be as effective or efficient resulting in clinical fatigue and inconsistent clinical results we can look for new tools and techniques. One tool available is the Air-Flow air polisher by Hu-Friedy. The Air-Flow simplifies biofilm management. This advanced polisher uses air and water pressure along with glycine that removes stains, plaque and soft deposits both supragingivally and subgingivally. Glycine is a protein that is a biocompatible non- essential amino acid that is water soluble. 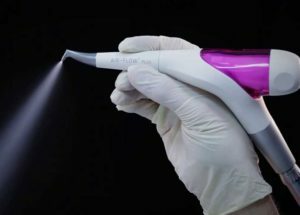 Air-polishing with Air-Flow using glycine has been shown to remove plaque more efficiently than hand instruments and is as effective as ultrasonic instrumentation. The Air-Flow can be three times faster removing plaque and stains than the traditional way with rubber cup and paste. This can have an impact on any dental practice. Some of the benefits of using the Air-Flow are time saving and clinical efficiency, superior cleaning and biofilm management, higher level of care, comfortable treatment, added value to your practice and state of the art innovation. The Air- Flow is effective for implant maintenance, orthodontic brackets and wires and is safe for composites, crowns, amalgam restorations as well as tooth and root surfaces. The Air- Flow is used before any scaling begins and polishing first has some great advantages. Polishing first allows for easier calculus detection, increased efficiency for bio-film removal both supragingivally and subgingivally, decreased potential for scratching or abrading tooth and restoration surfaces and easier access to difficult areas. The glycine powder is less than half the size of sodium bicarbonate thus reducing the potential for abrasions on the root surface by approximately 80%. We have all had the challenging client that we can’t achieve the clinical results we desire. Some are too sensitive for ultrasonics, have implants that are difficult to maintain with ineffective tools or may have non-responsive periodontal disease. We continue to use the same tools and get the same results. In elevating our standards of care this tool provides us with an opportunity to better serve our clients with the oral and systemic needs that empowers your hygiene team and increases patient awareness and ownership of their oral health. This is a way to revolutionize your practice and increase the potential of improved treatment outcomes.